Lately I’ve received numerous Beck and Call requests for wedding guest dresses to wear through the rest of summer. If you live somewhere like Texas, the high temps are pretty much unbearable in July and August, making it somewhat difficult and uncomfortable to get all dolled up! Finding dresses that won’t stifle you, won’t show sweat, and still look church appropriate can be tricky. 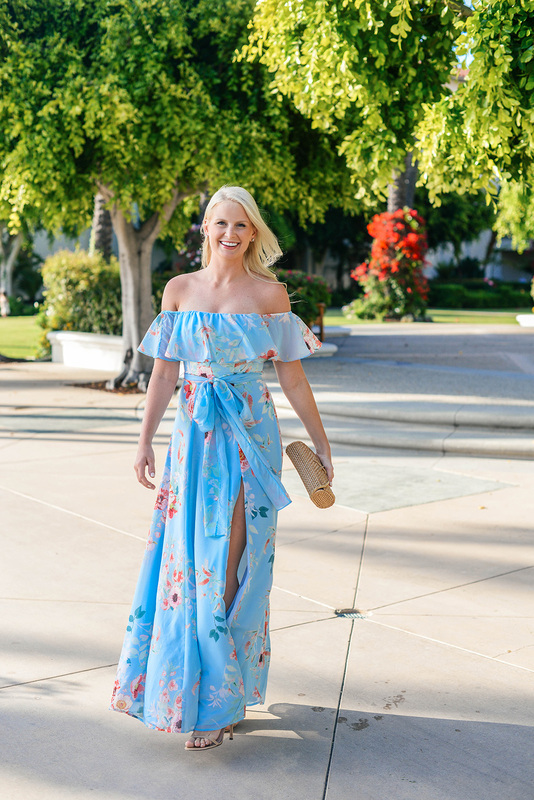 I originally purchased this floral maxi dress to wear to the wedding I attended in NYC a couple months ago, but decided not to wear it. I showed it to my friend who was in the wedding, and she let me know all of the bridesmaids were being asked to wear a floral maxi dress! I decided to take my red Zac Posen number instead, and saved this pretty maxi for another occasion this summer. I brought it with me to California and thought it would be perfect for my birthday dinner with the family! I love the fitted waist and belt, both which draw attention to the narrowest part of my body. It also flows as you walk in such a dreamy way – it looks like you’re gliding across the floor! So romantic. 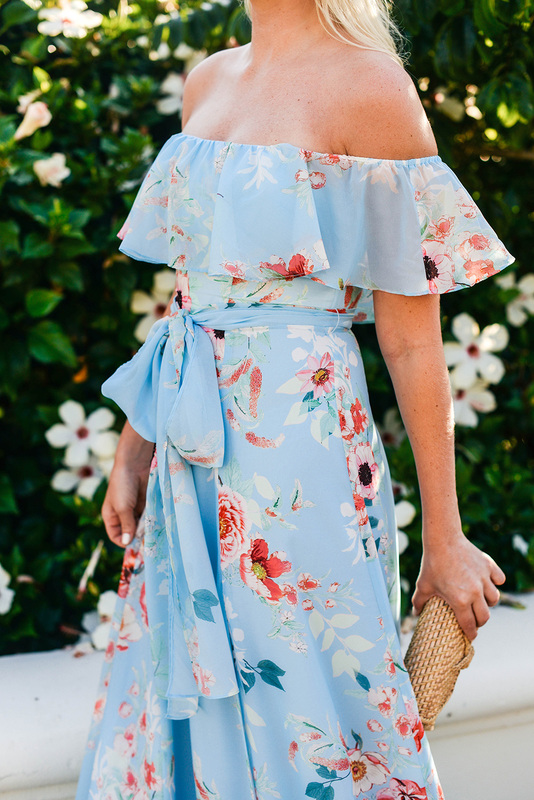 I think it’s the perfect style for an end-of-summer wedding, don’t you? Love the light lilac shade and sweet ruffle details on this number! This lace dress looks very Self-Portrait, but it’s currently on sale for under $200! If you’re looking for something modern and clean, try this black + white tiered minidress. If you don’t mind going without a bra, I’m still obsessed with this floral dress with an open back. So unique and cool! Adore the structured bodice on this strapless lace NICHOLAS dress! Loving the minty green color of this one-shoulder look. So pretty! The magnificent marigold shade and textured lace on this dress would look amazing with a tan! For a style you can wear now and later this fall, try this cute LBD. Is your style on the more preppy side? Try this pale pink scalloped shift! The prairie floral print on this other Yumi Kim maxi is to die for! So dreamy, don’t you think? Great choice, it looks amazing on you! This dress is so gorgeous!! Definitely perfect to wear to a wedding! This dress is absolutely gorgeous! The color is perfect and I love the off the shoulder detail! I love this dress and think it looks great on you! It would definitely work for a lovely dinner or summer wedding, even in Texas. I’ve been to an August wedding in Houston and I died! Well, not really but it was hot, like for real hot. A breezy dress would have made it bearable.